Historic Augusta, Inc. purchased the former Presbyterian Manse at public auction on March 23, 1991. The City of Augusta provided the funds with which to purchase the house through a grant to Historic Augusta. At the time of the purchase the building housed a beauty parlor and florist shop, as well as a private residence. Historic Augusta President Nancy Bowers appointed a committee to give direction to the Board of Trustees, with John C. Hagler, III as chairman. Thanks to seed money provided by The Creel Foundation, the services of architect Norman Davenport Askins of Atlanta were procured to guide the committee through the process of studying the house and determining its best use. The results of this study, which included an architectural assessment by Askins, an archaeological assessment by Dr. David C. Crass, an historical assessment by Erick D. Montgomery and landscape considerations by Mary Palmer and Hugh Dargan, were published in February, 1994. It was agreed that the site was highly significant for its association with the boyhood of President Woodrow Wilson and it should be developed as a house museum to tell his story as a Southerner. Collaborating in this assessment was the late Arthur S. Link, of Princeton University, the foremost authority and biographer of the 28th President. Link came to Augusta for the first time in May 1992, to be the keynote speaker at the first Woodrow Wilson Symposium, organized by Dr. Edward J. Cashin, Jr. of Augusta State University. 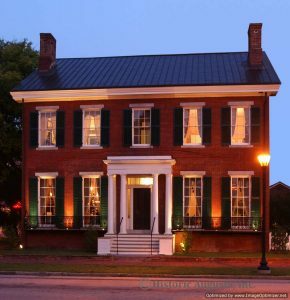 Experience President Woodrow Wilson’s Augusta childhood by visiting his restored boyhood home at 419 Seventh Street. The house museum is owned and operated by Historic Augusta, Inc. Check out our new video below for a preview or visit www.wilsonboyhoodhome.org for more information.